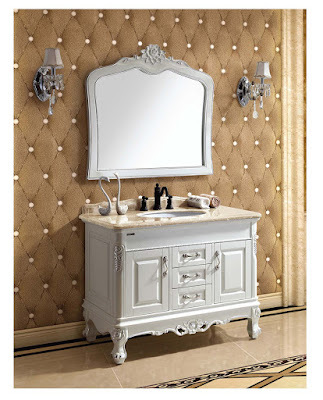 Your vanity cabinet may be spilled and stained by soap, toothpaste, make-up and shaving cream, and be caused stains and spots by the mineral buildups in hard water. Keeping your vanity cabinet clean is not only hygienic but will also help preserve it over the long term and make it looking fantastic. 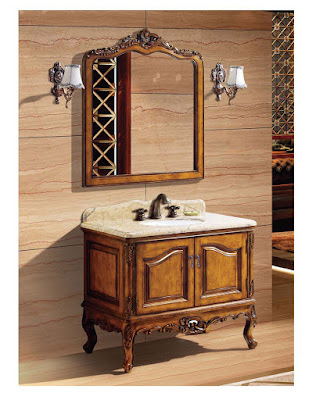 Here are some tips for cleaning your vanity cabinet and remove stains from it. First of all, remove the things from the counter top, like bottles, soaps and other bathroom accessories. Keep in mind that it is important to use non-abrasive cleaners when cleaning your bathroom surfaces, no matter what material they are made from. Pay more attention to the areas where soap scum builds up and clean off any obvious rings left by bottles or cans. Wash the areas down using a tight weave cloth and warm soapy water. Then dry it immediately with a dry cloth to prevent streaking. Here are some tips about how to remove hard water and toothpaste stains. 1). Mix 1 tbsp. of lemon juice and 1 cup of vinegar. 2). Rub the mixture on the stain with a washcloth and allow it to soak in for three to four minutes. 3). Rinse it off with water and a washcloth. 1). Combine a 1/2 cup of baking soda, 1/2 cup of liquid dish detergent, and then add 1/4 cup of vinegar, until reach the desired consistency. 2). Rub the combination onto the stains, and wipe away with a washcloth. 3). Spot clean with a dab of dish detergent, followed by a sprinkling of baking soda. Dry up the combination with a washcloth to remove. For bigger stains or stains on expensive wooden vanity, it can be a good idea to hire a professional to do the job for you.